National University Honours 4th year Re-Scrutiny Application Process & Result 2017.NU Honours Rescrutiny Result & Application system available at bdeducationinfo.com . Many student want to apply honours Re-scrutiny for better result. I will show you how to complete Honours Challenge Application in 2017. Student can get all information about Re-Scrutiny Result of Honours 4th year 2017. Let`s follow this Step for complete your Honours Re-Scrutiny Application. Some days ago NU 4th year result has been published. University Honours 4th Year Result Re-scrutiny Application Process and Fee payment Option Will Describe Here. However, Lets Go To Main Part of Honours 4th Year Challenge Application website.Now NU Authority Announce a Notice About Result Re Check. NU Honors 4th Year Exam Result Check Application Will be Complete by Online Method. Students have to Apply Within 01 June 2017. Application Will Not Accept After Deadline. Though Many of Students may not get their desire result. So Examines Will be want to Overlook Honors 4 year Exam paper. Students Will get the change to overlook Exam Paper by Examiner. Students have to Apply Through Online Application Form provided by NU Authority. Per Exam Paper Fee TK. 800 Taka. 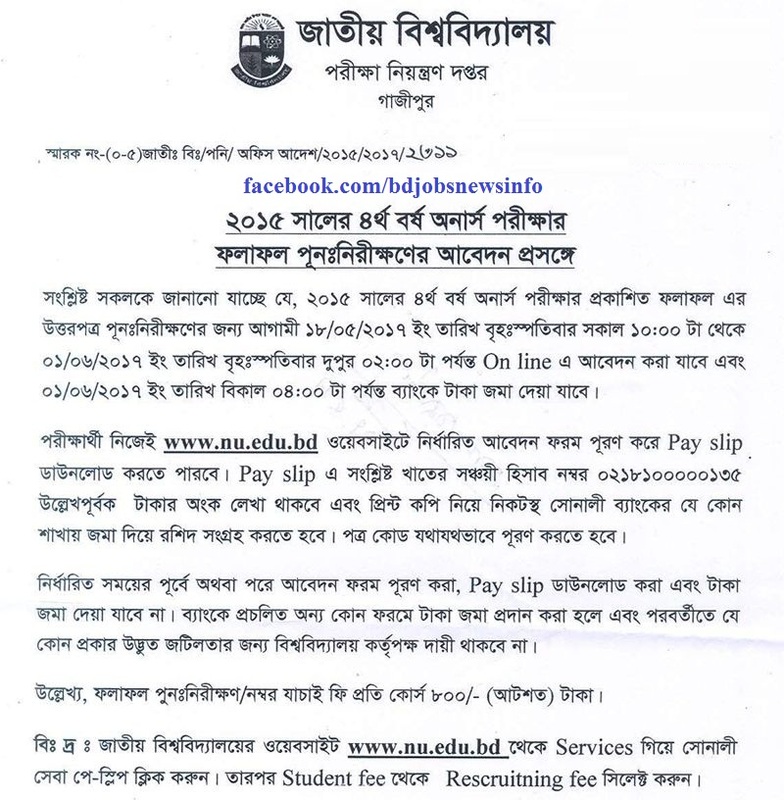 Examinees have to Submit Application Form With a bank draft for National University. To Apply for Result Re-scrutiny, You have To Follow The Instruction, Which Provide in The Below Part. After Complete Online Application, You Must have to Pay Application Fee Via Sonali Sebha. Now Hover The Mouse on Services and Click Sonali Seba. After Click re-scrutinizing Fee and Fill Up The Form With Semester / Year/Part and Registration Number. After Complete The Online Application, Pay Your Application Fee by Print The Payment Slip. You must have to Pay Slip by Sonali Seba. Hope You Successfully complete your re-scrutinizing application from bdeducationinfo.com . For Next updates about NU Honours Rescrutiny Result , Notice etc stay visit this website. Thanks for Keep reading this post form your web browser. This entry was posted in Notice, Nu Notice, University Admission by admin. Bookmark the permalink.